Insider threats are a larger concern for most organizations than cybercriminals or hacktivists, according to a BetterCloud report. The biggest security threat to your business likely isn’t a cybercriminal or hacktivist, but someone already in your organization, according to a Wednesday report from BetterCloud. The vast majority (91%) of the 500 IT and security professionals surveyed said they feel vulnerable to insider threats, whether their acts are malicious or accidental. More than half (53%) of respondents said they felt the employees who were most likely to be a threat were those who have left or were planning to leave the company, or contractors whose contract had ended, according to the report. 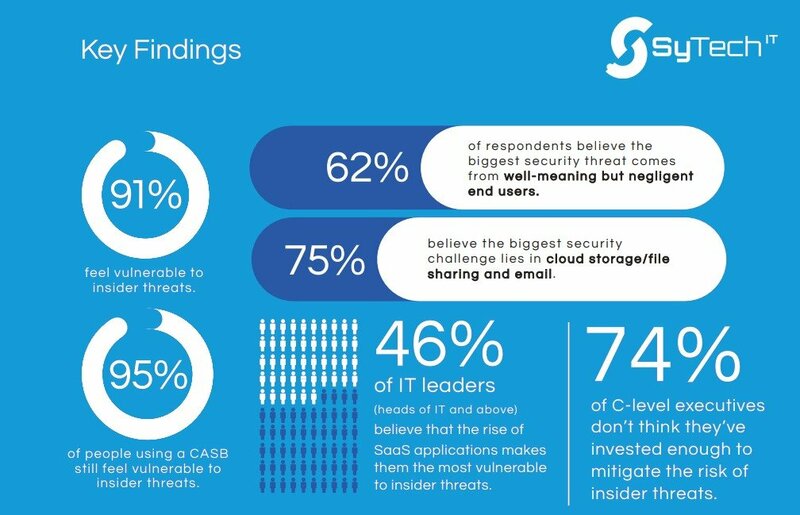 Three-fourths (75%) of respondents said they believe the biggests insider security risks lie in cloud applications, including popular file storage and email solutions like Google Drive and Dropbox. “The rise of SaaS in the digital workplace has made companies more vulnerable than ever to insider threats,” David Politis, founder and CEO of BetterCloud, said in a press release. This is due to taking control over data with SaaS applications from IT teams to end users, as well as the increasing complexity of the SaaS application infrastructure, Politis added. Indeed, 46% of IT leaders surveyed said they believe the rise of SaaS applications has made them more vulnerable, the report found. And 40% said they believe they are most vulnerable to exposure of confidential business information, including financial data and customer lists. Of the C-level executives surveyed, just 26% said they have invested enough to mitigate the risk of insider threats, versus 44% of IT managers, the report found. Based In Keele, SyTech IT provide IT Solutions, Support & Systems for Industry and multi channel distribution businesses within Stoke-on-Trent, Staffordshire, Derbyshire, Cheshire, Lancashire, Warwickshire, Birmingham and Manchester.